A while back I showed how I hang custom tool panels on French cleats, a great way to keep your hand tools safe yet close at hand. Recently I found a cool alternative to my approach, using multiple French cleats this time for an even more versatile system. It’s all part of an article I just turned in to Woodpeckers Inc., a top-notch U.S. hand-tool manufacturer. They’ll be adding how-to articles to upcoming catalogs as another way to serve their customers, and mine will be one of their first. The article came about because a lot of people don’t realize that the CNC-cut tool boards that come with their Woodpeckers squares and straightedges can be hung on the wall to store and display these handsome tools. Small tabs keep the tools safely in their pockets, making it just as easy to take a tool down as it is to put it away. Turns out the time-tested French cleat is a great way to hang those tool boards. In fact, Woodpeckers suggested I hang several rows of cleats, giving users even more ways to arrange their tool boards. What’s funny is that the technique Woodpeckers is using to cradle their tools in pockets is called French fitting, so we have the Gauls to thank for that technique too. The cleat array holds my custom tool panels just as well, letting you store and display the rest of your most-used hand tools in an even smaller space. Here are a few highlights. Look for the full article in an upcoming catalog or email from Woodpeckers. Here are the lovely Woodpeckers tool boards hung on the wall. One of my custom tool panels is in the background, holding the rest of the hand tools I use most. Once you have the first French cleat screwed into your wall studs, a spacer makes it easy to hang the rest. I attached small cleats to the tool boards, making it easy to arrange them into a pleasing array. Here’s how to make a custom chisel rack, one of many holders I made for my custom tool panel. Lay all your chisels across a block and mark their widths on the wood. Then just dado out the waste areas as shown. Glue another strip over the top, and your rack is done. To match the rounded look of my big panel, I rounded all of the corners and edges on the tool holders too. Note the square piece of MDF I’m using to support the piece while I rout its end grain. The finished panel and holders look and work pretty slick. This approach works for tool accessories also, letting you organize bits, blades and wrenches near their respective machines. When we moved to Portland in 2015, we bought a fixer-upper, with all the sad hallmarks of 1970s construction, including a world of nasty old carpet, filled with decades of dust and dander and God knows what. Let’s not even talk about what I found when I pulled up the old carpet pads. As soon as I could, I started tearing the funky old carpet out of the house, replacing it with hardwood flooring–and with new carpet in two small rooms. While the Home Depot carpet installers were at the house, I pulled up the last bit of old carpet in the house–on the stairs–and dumped it into their truck (with their kind permission). Then I waited till I had the time to tackle the stair remodel. Underneath the carpet was just cheap 2×10 construction lumber, with thin boards nailed on as risers. But I had a plan and a few tricks up my sleeve. After seeing thick fir treads at a local restaurant, attached with screws and plugs, I figured out a way to do the same at our place. My wife and I like rustic elements in home design, and I had purchased a pile of thick native fir for a song from a local sawmill, earmarking them for our new treads. The challenge was how to add thick treads without raising the level of the stairs too much and having an extra-tall step at the bottom and a problem where the top stair meets the upstairs floor. The solution was a miter technique that gives a thin board the appearance of a very thick one. I learned it from a great woodworking friend, Mark Edmundson. The miter technique let me wrap a wide, 3/4-in.-thick board over the front of every 2×10 tread, and make that board look 1-1-/2 in. thick. I started with thick fir, but the cool thing about this trick is how it will let you start with 3/4-in. boards that are already surfaced. I only used thick timbers because I got them cheap. The other challenge would be seamlessly fitting risers into the spaces between the treads. For that I used an old trick borrowed from the countertop and cabinet trades: a cardboard template. By the way, we went with a simple oil finish to complete our rustic look, embracing the wear and tear as part of the character. But you could do this technique with a fine hardwood too, and top it off with a much more protective polyurethane floor finish. I did my best to grab some shots along the way, so I could share as many tips as possible. Enjoy! I only used these thick slabs because I got them cheap. The easiest way to do the miter-wrapping technique below is to start with 3/4-in. stock that’s already surfaced. They key is using very wide boards, wide enough to cover your stair treads with enough left over to wrap down over the front edge. Luckily I have a very wide jointer and planer. You won’t need one if you buy 3/4-in.-thick boards that are already surfaced. After jointing one face, I made a huge resaw cut on my bandsaw, which worked great with a sharp, coarse blade (3 tpi). After planing both faces and cutting the parts to width, I buried the blade in an auxiliary fence on the tablesaw to make the long miter cuts. The idea here is to adjust the fence so the miter reaches almost to the edge of the stock but not quite. You need a little bit of the square edge left to ride the fence and keep the workpiece stable. Here’s the miter-wrapping trick. Start with the pieces face down and pull blue tape tightly across the miter joints like this. Note how these two pieces came from the same board, so there is a perfect grain match at the seam. Then run a piece the long way down the seam. Burnish it down with your thumb and then carefully flip the pieces over on the bench. Brush a thin coat of glue onto the miters, which are facing up now. Now all you have to do is fold the miter closed and pull more strips of blue tape across to clamp the joint tightly closed. Once you sand the corners a bit, you can’t see the seam at all and the board looks like a thick slab! No one can tell that the fat edge is just more of the same face grain. The next thing I did was used a plug cutter on the drill press to make a ton of plugs. The trick is not to drill all the way through the board, so the plugs don’t come free and get stuck in the cutter. Now just make a bandsaw cut like this to cut the plugs to the length you need and free them from the board. The tape is there to keep the plugs from rolling away. I pulled it off here to show you the deal. So here are the new treads in place on the old staircase. I drilled counterbores and clearance holes in the treads beforehand, crosscut them to fit the spaces, applied a simple oil finish, and then screwed them down and plugged the holes. If my boards had been a little wider, I would have made the front edge taller and completely covered that old tread behind it. I milled some of the same boards for the landing also, using a shiplap joint between them and screwing and plugging these too. Then I sharpened the blades on two block planes, set one for rough cuts and the other for fine, and went to town on those plugs. The treads had finish on them and the plugs didn’t, so I just dabbed some more oil on the flush plugs when I was done. The big plugs go well with the rustic wood and oil finish. All that was left was fitting and nailing riser boards into the spaces between the treads. Before I added the new fir riser boards, however, I had to fill the spaces under the old treads, so my new boards could reach from one new fir tread up to the other. I did that by screwing some some 3/4 in. plywood (not shown here yet) into the spaces. For the risers, I bought clear vertical-grain (CVG) fir, and sawed and planed it into thin boards. The trick was how to fit them seamlessly into this irregular space. The solution is this cardboard template. I just detached the taped pieces, pressed them against the ends of the space, and taped them back on. Above and below are the fir risers already fitted and nailed into place. Once I ripped my thin fir risers to match the height of the space, I used the cardboard template to mark the ends for crosscutting on my mitersaw, angling the blade as needed to hit the line perfectly. I attached the riser boards with thin brads from my air gun. The nail holes are almost impossible to see in the finished staircase, especially if you position the little slots for the heads horizontally, in line with the dark grain lines. We love the look of our new stairs. I added fir railings to match. The landing is rustic fir too, just the way we like it. I just have to add a few white base moldings and I’m done. Phew! This is the gate I made, with the small gridwork pattern I copied later for the balcony railing system. Japanese-style grillwork like this is called kumiko. Back in 2016 I designed and built a Japanese-style gate, which appeared in Fine Homebuilding magazine this past year, and appears every day in my backyard (the best part). I visited the Portland Japanese Garden for inspiration, as well as a few websites and Google images. Once I settled on the design for the gridwork panel in the door, I realized it would also work at larger scale for the railing system on an upper balcony that sticks out of the house, just across the backyard patio. Well, this year (2018) I finally got around to those rails and balusters on the balcony, which used to be that generic contractor grade you see on condos and apartment buildings. Fine for what they are, but a combination embarrassment/challenge for a woodworker like me. I started by pulling down all the wobbly posts and rails and taking it all to the dump. Then I covered the joists with TimberTech, the same excellent composite decking I used on the deck in the backyard, and screwed new posts onto the deck using these long, awesome, decorative screws designed for thick timbers, from Home Depot. The posts are cedar, as is everything in the new rail system. I added top rails to the posts, and screwed a composite deck board onto the top of each one. The next key part was adding a bottom rail, with would complete the rectangular frame where each panel of gridwork would go. To keep those bottom rails parallel to the top, I just made a spacer stick, which I pressed the lower rail against when screwing it into place. BTW, I held it in place with a combination of angled screws and these decorative angle pieces, which look nice. As for making the grillwork balusters, I started with 1-1/2-in.-square cedar stakes/balusters you can buy at the home center. Then I did some drawing to scale up my original, small grillwork to suit the thicker pieces. You want to get the horizontal spacing adjusted so there are even spaces at each end. Then I cut all the pieces to fit inside the rail system. Your spaces will probably vary from post to post, so keep track of which grid pieces go where. The vertical lengths should be consistent, since you used that spacer stick to set the lower rails. As for the rest of the process, I’ll let the photos do the talking. I started by notching the vertical pieces. Those only get four notches each, two near the bottom and two near the top, so you can do those with a dado set, using your tablesaw’s rip fence as a stop. They key is to make each notch narrower (1-3/8 in.) than the thickness of the cedar pieces (roughly 1-1/2 with a lot of variance). You’ll see why later. As for the depth, you should try to nail that, exactly halfway through the thickness. To cut the notches in the horizontal grid parts, I created a jig like this one, which clamps to your miter gauge. You just cut a notch in the fence, and plane a small stick to fit in it. Then you move it over and cut another notch in the fence that is the same distance away that you want each vertical piece in the grid. … and then bump it up against the other side of the key to cut the rest of the notch. You continue this way as you work your way down the whole row of notches. The jig ensures even spacing. Unfortunately, it’s also pretty sensitive to how much side pressure you apply against the key, so check every third notch to be sure the the widths are staying consistent, and go back over them if needed. The last step before assembly is to plane the sides of all the pieces to 1-3/8 in. wide, so they all fit into their notches. Do a big dry-fit to make sure they do. Make sure they all go in easily, and run tight pieces through the planer if needed, marking where they go in the grid. When everything goes together nicely, you can brush glue into the notches and assemble the grid for real. Installing the panels was easy. I just screwed strips to the rails and the posts as a stopper at the back edge of the gridwork, using the spacer in the next photo to maintain the right inset. Then after the grid goes in, you screw identical strips in front of it, trapping it solidly in place. Works great! The new rail system looks awesome. My last step will be to tack on cedar planks near the top of the joists, to cover the ends of the deck boards (and that patch of dry-rot!). I’ll put spacers behind those thin cedar planks, to keep water from getting trapped there. I continue to design and build DIY projects for Digital Trends, and this is one of my new faves. It’s a great-looking, super-functional rack for your collection of vinyl records, which also happens to be totally easy to build. The how-to video is up now, and here are some of the highlights. This rack is nothing more than four simple pieces, notched together. The four parts of the rack are held together with simple notches, which are so sturdy on their own that you don’t have to nail the fit of each one and they don’t have to be glued. That means you can cut them with a wide variety of tools, by hand with a coping saw, or by power with a jigsaw or bandsaw. If you’ve got one, I believe a dado set would do the tidiest job, but it’s not necessary. I found one gorgeous 10-in.-wide jatoba board at my local hardwood shop, and cut all the parts from that. You’ll need about 60 in. of length, and a 1-in.-thick board will look better than 3/4, though it’s all good. You don’t even have to nail the dimensions, but the 10 degree angle in the feet and the splay of the sides is pretty close to perfect I think. You’ll need a tablesaw to cut all the parts to width cleanly, though you could do it with other tools. Another option is to ask your lumber dealer to cut up the board to the lengths and widths you need. After that, there are a couple of really cool tricks for laying out the notches. Start by chopping the feet to that 10-degree angle on the ends. I used a miter saw for that. After penciling in some tick marks for where the notches begin, you can use the end of one foot to lay out the notches in the other! Just lay one foot atop the other, reversing the angle of the end to create the same 10-degree angle in the other direction. To get the other side of the notch, there’s another simple trick. Lay the foot on edge on that first line and trace its other side. In other words, you are using the actual boards themselves to lay out notches that will fit them. The notches in the tall sides are square, so laying those out is easier, but still use the feet on edge to lay out the second side of each one. After that I used a jigsaw to cut along the inside of each straight pencil line, and then made curving cuts to remove the waste piece between them. Then I sanded the whole project to 220 grit, broke the edges lightly with 150-grit paper on a block, and applied two coats of Minwax Teak Oil, rubbing each dried coat with a brown paper bag to burnish it–another great trick. As you can see, jatoba takes a beautiful polish. I first saw this project at Maker Flat, a Portland B&B created by Bryan Danger and filled with handcrafted furniture and accessories. On the front deck was this awesome sign with the house number formed by screws, acting as pixels of a sort. I was blown away and decided right then to both make one for my house and to put a picture of Bryan’s sign in my next book (chock full of maker projects, coming out in fall 2018). Here is Bryan Danger’s house sign, which was the inspiration for my own. And here’s mine, which looks awesome next to our front door. Since the book only contains a picture of Bryan’s sign, with no how-to, here is the step-by-step for creating one like mine. You can do it all with a cordless drill, but it helps a lot to have a drill press for the pilot holes, so each screw goes in perfectly square and the sign ends up looking very uniform. Also, I used about 6 lbs. of 2-1/2-in.-long stainless steel screws, which aren’t cheap. You want stainless steel, which won’t rust or tarnish outdoors. I drove them into a cedar decking plank, which will weather to a nice gray. But you could use other outdoor woods for your sign, like white oak, teak or ipé, and put a finish on them to preserve the color if you want. Personally, I’ll enjoy the contrast between weathered wood and the shiny screws. I also took advantage of a sweet Woodpecker’s T-square for laying out the grid, though a normal square and tape measure would work too. Read on for all of the steps and tricks. We love the finished sign, and visitors always stop to give it a close look. “Gorgeous,” one said recently. Music to my ears. If you get all the screws evenly spaced and at the same hight (more on that later), they will catch the light all at once and look amazing. Step one is creating a grid. I used this big awesome T-square from Woodpeckers for this step, sticking my pencil in the the holes and sliding the square to draw parallel lines. The key here, aside from accuracy, is creating a grid that will space the heads of the screws as close as possible without them touching. 3/8 in. worked well for my screws, which are #10s. Design is the hardest part. Draw circles on your grid to simulate the screw heads. What you are actually doing here is creating a font. I had to re-do this whole grid and layout thing three times until I had created numbers I liked! Here’s the whole layout. Note how the slanted part of the number 7 actually has screws that land halfway between grid lines. Sticking strictly to the grid forces all diagonals to be 45 degrees, which is too much for some numbers. Use an awl to punch the center of each hole. This will keep the drill bit from wandering. You can drill these 3/32 in. pilot holes by hand, but a drill press guarantees they will go in square for a perfect-looking sign. Let the bit find the center of the dents you punched earlier. Sand away your pencil marks. If you want to apply a finish of some kind, this is the time to do it. Put a flat board next to the last row you drove, and adjust the screw heights by hand, feeling with your fingers to be sure they are at the same level as the board. Your fingertips are super sensitive to any differences. Note: I drove the first few screws all the way through the board, so their tips just reached the back side, and then planed this board to the height of those screws. I attached 4 keyhole hangers from Rockler.com for hanging the sign. That’s it! Screw the sign to your house and be the envy of the neighborhood. There’s no mistaking the look of handcrafted work. With the help of two really cool companies, I’ve been producing videos of some of my coolest new projects. 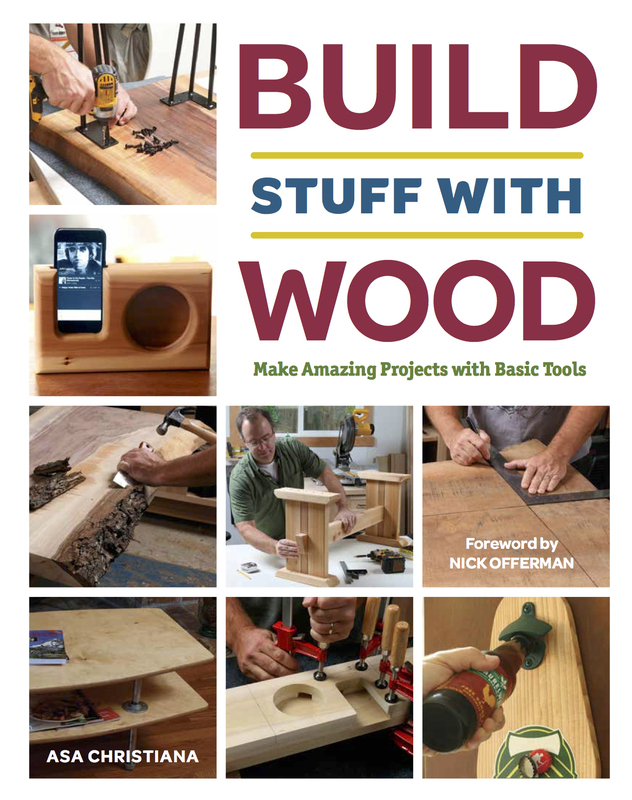 As always, the main idea is totally do-able projects that are totally worth doing, like the stuff in my 2017 book, “Build Stuff with Wood.” Links to the videos are below, and I’ll provide more as time goes along. One company is Woodpeckers, a manufacturer of top-class woodworking tools right here in the U-S-of-A (Ohio actually). I’ll be sharing all sorts of techniques and projects on their YouTube channel. So subscribe to see all my future videos. This time around, they asked me to design a project around their new M2 box clamps, clever little gizmos that keep parts at perfect right angles while you screw or clamp the joints together. I designed two cool mitered boxes in the Mid-Century style, and attached hairpin legs to turn then into little side tables or nightstands, with an opening in the middle for books and storage. Here’s the video that shows how the box clamps help. The other company is Digital Trends, a hip reviewer of all things tech, based right here in Portland. They’ve hired me to design and build a bunch of stuff, like the pallet-wood beer caddy I blogged about here, and super-cool frames for your nicest vinyl records. Those frames were inspired by something very similar by Jonathan Odom of Instructables.com. He is a fountain of amazing ideas. I especially love how the album covers can slip in and out without removing the frame from the wall. Beautiful as they are, those record are meant to be played! The caddy video is here, and the record-frame video is here. In all cases, with Woodpeckers and Digital Trends, I provide the designs and do the building, and they produce the video, which is nice for both me and you! Hope you like them! My latest book, called “Handmade: A Hands-On Guide,” just went on Amazon and I wanted to give you all a taste. While my 2017 book, “Build Stuff with Wood,” is all about making sawdust, this one blows open the doors to a dozen other ways of making things. There is a new handcrafted revolution happening, and it’s breaking down the old boundaries with an explosion of pure creative joy. A brief history is in order. When the digital era first arrived a few decades ago—with video games and cable TV at first, then the Internet, social media, YouTube, Netflix, and so on—it dealt a crushing blow to the hands-on life. All you had to do was look around your neighborhood to see fewer people working on their homes and gardens, fixing things for themselves, and doing crafts like woodworking. But the urge to make things by hand is an ancient one, and refuses to die. As best we can tell, homo sapiens walked upright onto the world stage 200-300,000 years ago, with a genetic lineage that extended millions of years before that. That makes modern society a mere instant in human history. We evolved—body and mind—to resist the brutal forces of nature, by hunting, gathering, making and using tools, and mastering all of the materials we could get our hands on. Our survival depended on it. I argue that much of what makes us truly happy contains echoes of that evolutionary history: love, laughter, cooperation, outdoor living, being self-sufficient, and making things with our hands. For many of us, digital natives or not, these essential experiences are more deeply satisfying than pressing buttons and swiping screens. Building things unites your body and mind in a single task, forcing you to focus on the moment, slowing your chattering monkey brain to a more methodical, peaceful pace. You were naturally selected to love it. Like any tool the Internet can be used for good, bad, and everything in between. The whole time it was rendering us helpless, it was also feeding a rebellion. Inspired by the hacker movement and empowered by the Web, a new generation of makers began using digital tools like 3-D printers, laser cutters, microcontrollers, and circuit boards to build things on their own, outside the reach of corporations. Soon they were mashing up their projects with wood, metal, and other building supplies, and a rediscovery of traditional crafts soon followed. It’s a Golden Age for makers of all stripes. Dozens of YouTube channels, blogs, and sites like Instructables.com will teach you how to DIY almost anything. Makerspaces are popping up in urban centers around the world, answering a new generation’s need for equipment, education, community, and a place to work. This is ADX in Portland, Oregon. Facilities like The Build Shop in Los Angeles offer affordable rental time on 3-D printers, laser engravers, and more, with expert help available. There are community workplaces of all kinds scattered around the country, like San Francisco Community Woodshop, which offers education and excellent equipment. Whether they call themselves makers, woodworkers, leather crafters, inventors, hackers, or just people having fun, there is a common thread: the desire to build something rather than buy it. This new maker movement is way more about creativity than perfection, about using whatever, tools, skills, and supplies you have to make something cool. And the old boundaries just don’t matter. Want to mash up micro-controllers with wood and metal parts, do it. Want to dive deeply into a traditional craft, that’s great too. “Handmade,” out now on Amazon, is for everyone on the outside looking in, enticing them with a wide range of projects anyone can do with simple tools and supplies. Better yet, you’ll be making practical items that will become part of your life. Here is just a small taste. Ezra Cimino-Hurt builds boom boxes into vintage suitcases, with high-end components that put real soul back into your mp3s. Jed White made this steam-punk lamp with copper pipe, an Edison bulb, and a few simple electrical supplies. Geoff Franklin shows how easy leatherwork can be with elegantly simple items like this tabletop valet. Mike Warren, of Instructables.com, made this tabletop fireplace with concrete and plumbing pipe, and a super-simple casting method. Mike’s fellow full-timer at Instructables, Jonathan Odom, designed and built a cardboard chair that is amazingly sturdy and comfy! This outdoor table, with 2×4 base and concrete top, is the brainchild of Brad Rodriguez of FixThisBuildThat.com. And Rob Leifheit made this awesome LED sign with an IKEA frame, a laser-cut mask, a few LED strips and a $10 LED controller that makes the colors dance.